Snuff, or powdered tobacco, became fashionable in Europe in the early 16th century. The habit of inhaling or “snuffing” tobacco through the nostrils was introduced from the Americas by Ramón Pané [PDF], a young friar who had accompanied Christopher Columbus on his 1494 voyage to the New World. Since pipe smoke was often considered vulgar among the European upper classes, particularly so for women, snuff was quickly adopted by the elite. Undoubtedly a more refined method of tobacco delivery, snuff-taking rapidly became a class indicator, distinguishing the well-bred from the lower classes. In her book, Golden-Silk Smoke: A History of Tobacco in China, 1550–2010, the scholar Carol Benedict argues that the disagreeable association of smoking tobacco with the poor made snuff a welcome addition to the Qing court, and soon, the emperor himself was partaking. Unlike Europeans, however, China’s court had little use for snuff boxes. Instead it was customary to use snuff bottles, small corked containers that kept their pricey contents fresh and flavorful. Throughout the 18th century, snuff was an expensive habit; both snuff and snuff containers were almost solely associated with Qing patricians and royalty. Snuff bottles were a haute accessory, a status object that signified both the wealth and fashionability of its owner. Benedict notes that the association was so strong that, throughout the 18th century, snuff bottles were part of an elaborate system of gifting among the Chinese court. These examples, painted by Lesan and manufactured at Pure Bamboo studios, are made of gray glass and feature a nature motif and colorful green and yellow stoppers. 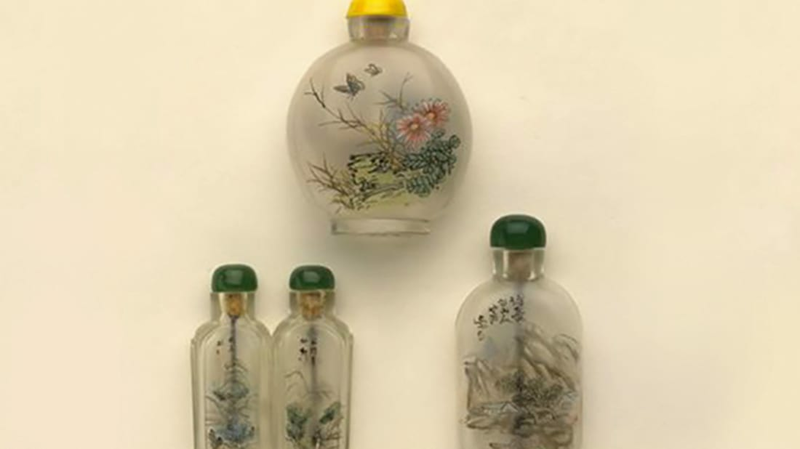 The production of Chinese snuff bottles ended with the Qing dynasty in 1911, and so the Victoria & Albert’s set dates from the end of a long and elaborate tradition.